No man or woman is an island. But if they feel like they are on an island, you, as a leader, need to know. In organizations of all kinds, teamwork and collaboration are more important than ever. And that means relationships are more important than ever. So whether you are trying to create a positive learning environment in your classroom or the best possible culture at work, you need to understand the group’s social dynamics. You may have a sense that someone is popular, or not everyone’s favorite person to work with, but lack the data to back it up. The good news is that sociograms can help. They provide data on relationships, and they are amazingly simple. So let’s cut to it: What is a sociogram? A sociogram is a tool for charting the relationships within a group. It’s a visual representation of the social links and preferences that each person has – valuable data for leaders. Why rely only on your instincts, when you could have valuable data about relationships? To construct a sociogram, ask each person to confidentially list two other people to work with on an activity. The topic does not matter. In most cases, the social relationships will be relatively constant regardless of the activity. Make sure they put their own name on the top of the paper. Then you write up this data as a chart. Arrows indicate who is choosing whom. The green arrows indicate that those people chose each other. Isolates – One of the alerts a leader gets from this is that there are some people – the isolates – who no one has chosen or who have only been chosen by another isolate. 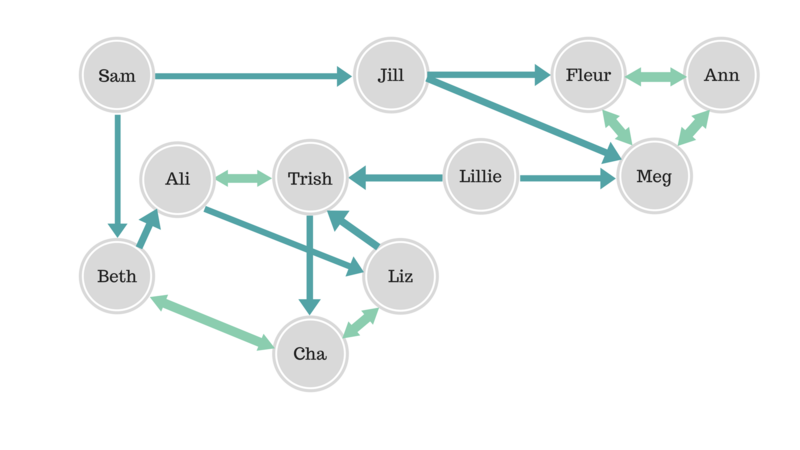 In the sociogram above, Sam is an isolate and so is Jill, having only been chosen by Sam. While it is wise to have a certain degree of philosophical skepticism in making initial assumptions about isolates, they are a cause for concern. You want to make sure they feel connected and supported in the larger group. Cliques – There are several quite tight groups which may well merit some degree of skepticism. Are these groups “cliques” that exclude others? Cliques are defined as groups of three or more people within a larger group who all choose each other. In the above example, Ann, Fleur and Meg have all chosen each other, and are clearly a tight group. You may want to observe to make sure they aren’t excluding other people. Stars – Stars are people who have been chosen many times on the sociogram. These people are generally popular and well-liked, hence being chosen by many of their peers. In the example given above, can you find one of the Stars? Remember, this is simply a guide. If nothing else, the sociogram can be used as a guide for further, more focused, observation. A neat, easy to use, and free tool for mapping the emotional dynamics of a group – check it out! Now we know! It’s a valuable tool for unlocking data on relationships and group dynamics. So whether you are a leader in a classroom or an office, you can use a sociogram to glean actionable data about the group’s social dynamics. Comments or questions? Post them in the comments section below. We are happy to help you construct your own sociogram. I also submitted this comment on the classroom section of six seconds, and think it worth posting here. Sociograms are powerful tools for working with groups. They were first developed by Jacob Moreno back in the 1920s and 30s. (Moreno also developed psychodrama, sociodrama and a number of other methods of working.) He used sociometry, the original theory from which sociograms come, to reduce absconding from a girls borstal by identifying and strengthening meaningful connections. One way to focus the work of the sociogram is with adequate warm up. Some teachers or managers just ask participants who their two best friends are, which would be minimal warm up. Or you could introduce the idea that some people in the group would be better than others to help you with a specific task, say doing a math problem. This exercise is not a popularity pole but an opportunity for you to think about who would best help you to do this this math assignment. You could repeat the exercise using different criteria. Someone who is an isolate on one criteria may be a star in another criteria. The sociogram can also be done in action. You make your choice by placing your hand on the shoulder of the person you choose to help you with a math assignment. Then everyone gets to see and you allow time for each person to share with the person they have chosen something of their reason for the choice. Then you invite group members to make their second choice. Conducting action sociograms is best done when you have had some training in the method, which is part of the psychodrama training curriculum in most countries. You need to be able to deal with the reactions of participants when they are over or under chosen and work with the group to appreciate the data that is being revealed.